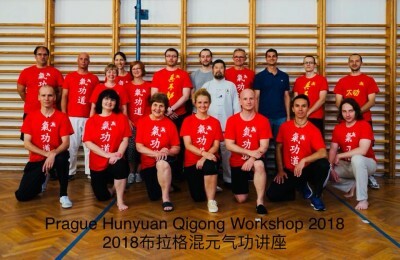 I hosted V. annual workshop with Master Chen in Prague. This time we had a different format of workshop. Instead of weekend, this workshop was held during weekdays. When I for first got info about dates, I was little bit sceptical about participants numbers, on the other hand I realised that this can be opportunity for my students, which could not afford to visit previous weekend workshops (still we are East Europe with East Europe salaries, meaning much lower than average in the West) with Master Chen. The only possibility to secure appropriate space was to change my regular public classes into workshop classes with Master (it is just impossible to find free gym during weekdays in Prague… all reserved). Luckily I am teaching 3 times per week 2 hours so there was enough hours to use them for workshop in order to make teaching meaningful (one hour would be just too short). So there were three days and two hours every day, 6 hours of teaching in total. 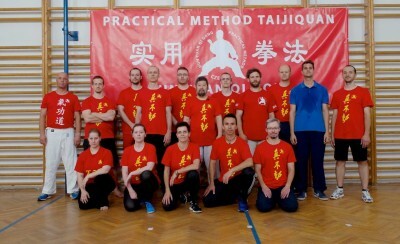 On Tuesday we had Hun Yuan QiGong class, Wednesday and Thursday were Practical Method classes. I created 45 spots for participants in total, taken immediately by 30 unique people. Sold out in 4 days. Some of my students went for all events, some only for one. I found also beneficial that majority of my students got united for first time (as they are attending different classes), so it was good they got to know eachother. We went through couple exercises from Hun Yuan Qi Gong set. 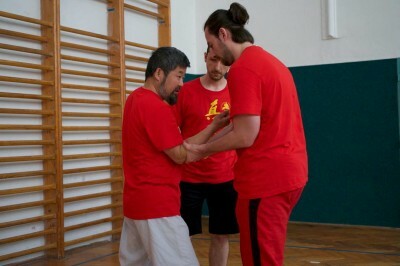 Master Chen gave us tips on: how to move, how (not) to breathe and many others valuable advices. He also mentioned some risks of practicing Hun Yuan Qi Gong, which was widely appreciated by audience as generally is Qi Gong presented as healthy exercise without any risks. It was eye opening and high level class of true Hun Yuan Qi Gong. Full house, unfortunately I don’t have group photo from Wednesday. I will not give you many details, as many videos will follow and will be available to download. But generally we revised basic (+/- circle, twisting towel, etc.). We did some 13forms. Not whole Yilu as there were beginners (just couple lesson) present. We worked in couples on finding axe in between two points. Master clarified to beginners what “pivot point” means. Do not miss videos as they will be published! The teaching of Master Chen was a pure concentrate. There was not a single word senseless. The feedback I got afterwards from students was tremendous and 100% positive. What I personally found great was, that many students later told me: “ That workshop was made directly for me!” Well I had similar feelings. We all here looking forward to next workshop with you!